Sharp's BIG PAD PN-70TB3/60TB3 is designed for smooth and effortless communication in a wide range of contexts. Their highly responsive touch pens allow several people to write on the same screen at the same time. 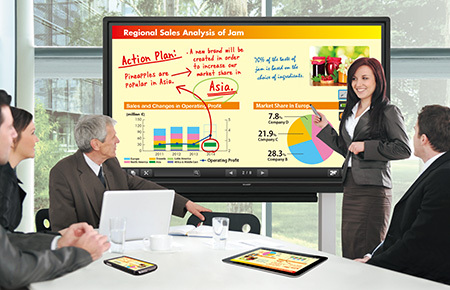 And SHARP Display Connect software enables multifaceted wireless communication. Whether in the boardroom or the classroom, Sharp changes the way you communicate. 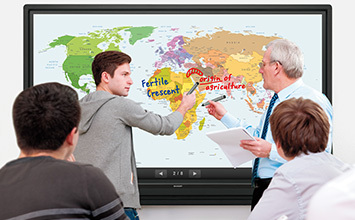 Recognising up to 10 points of contact, the PN-70TB3/60TB3 multi-touch LCD monitors allow up to four people to write on the screen at the same time using touch pens or fingers. Participants can take an active part in meetings, brainstorming sessions, classroom interactions, and more. Discussions and presentations become platforms for effective and lively exchanges of opinions. 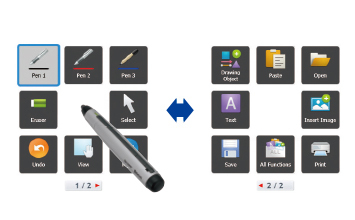 Using a touch pen, you can easily launch and display the SHARP Pen Software user interface—a menu comprising smartly arranged icons that provide easy access to pen settings and functions. 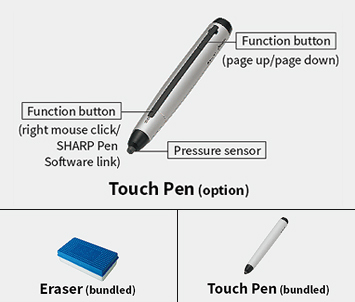 When using the optional touch pen with function buttons, each has its own dedicated menu, which can be displayed even when up to four people are writing on the screen at the same time. Pen settings such as colour and line thickness can be set for each touch pen. The optional touch pen with function buttons is so smooth and light that using it is like writing on paper. A pressure sensor at the tip of this slim and lightweight pen lets you write with high precision and with an effortless and uninterrupted flow. 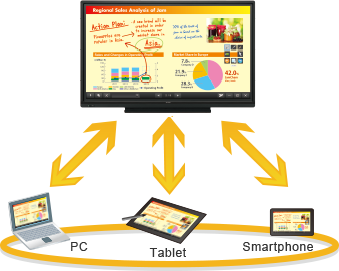 These LCD monitors feature a handwriting recognition* function for converting selected onscreen handwriting into standard text. 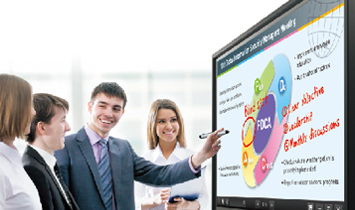 This convenient function allows you to utilise onscreen content to make neat and legible minutes of your meetings. The PN-70TB3/60TB3 comes standard-equipped with a wealth of input/output terminals—on the side and the bottom of the monitor—to enable easy connection with a wide variety of equipment. This array of terminals includes three HDMI™ ports, two D-sub ports, two DisplayPort™ terminals (one input, one output), and two touchscreen-supporting USB ports. One of the USB ports can be assigned to a regularly connected PC, such as a host PC used to operate the LCD monitor. The other USB port facilitates temporary connection to another PC, such as one used by a meeting participant. This allows easy PC connection without the need to switch the USB cable. Documents and images scanned from a compatible Sharp MFP can be imported directly to the SHARP Pen Software for display on the BIG PAD. For added convenience, image data shown onscreen—including notations—can be saved to a PC or sent directly to an MFP for printout. ■ Up to 50 mobile devices*2 can be connected simultaneously. *2 OS requirements (as of March 2017): Host: Windows® 7, Windows 8.1, Windows 10; Client: Windows 7, Windows 8.1, Windows 10, Mac OS X v10.7, v10.8, v10.9, v10.10, v10.11, macOS v10.12, Android™2.3–7.1, iOS® 6–10. Please comply with the license agreements of your OS and installed applications. Connecting 26 or more mobile devices requires at least two LAN access points.